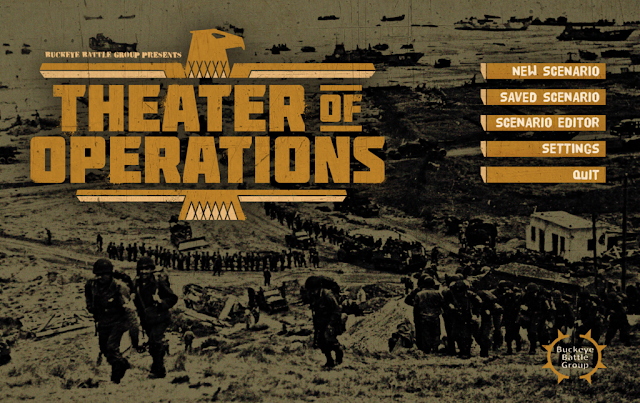 I would like to introduce you to Theater of Operations (ToO). On the surface it appears to be like most WWII operational level wargames, but it doesn’t take long to realize this title has a number of unique qualities that set it apart from others in this genre. Players take control of either the Axis or Allied forces as they battle in 1944 through the hedgerows of France, the Soviet steppes, or the mountains of central Italy. In each scenario you will direct the forces under your command to crush your foes. The base game will contain scenarios in Normandy, Italy, and Eastern Front in the summer of 1944. The game scope will be expanded by DLC to different areas and time periods. I hear the groans now about DLC, but if you don’t want to play in North Africa of 1942 then simply avoid this DLC. Only buy the area and time periods that interest you! Players take command of Axis or Allied forces (primarily but not limited to German, US, British and Commonwealth, and Soviet troops) and re-write history. A great amount of detail and analysis has been included to help simulate military operations. Players are rewarded for carefully planning their actions and taking calculated risks. Players will have to deal with real life limiting factors such as terrain, weather, fatigue, supply, time and space planning factors, and random SNAFU’s to name just a few. Play will be scenario based with each side attempting to meet their assigned victory conditions. Scenarios can range in size from a small regimental engagement all the way to commanding multiple corps of troops and everything in between. Scenarios can last a few hours to weeks covering a few kilometres or thousands of kilometres of land. Game map granularity will be 100 meter “tiles” which will allow dynamic unit movement and placement at the operational level. The game will include a scenario editor that will allow players to create their own scenarios. Players can issue various orders to the units under their command, and units will attempt to carry them out to the best of their ability. Many unit types can be split apart and organized with other units to create a hybrid unit called ‘battle group’. It can be a combined arms force that is issued orders like any other unit and sent in to combat. As ToO matures additional titles can be prepared. Some examples would be a companion game covering the air war in WWII, and different time periods for Theater of Operations (perhaps Cold War). It once failed utterly if Iam correct. Yes it is and you are correct. They jumped into a Kickstarter way to early with not enough to show and not enough publicity etc to get the backing. I'm sure next time it will be fine.